The FlexJet is known as one of the most capable and highest performing EDFs in its class. Building on that legendary performance, the FlexJet TV adds the next step in ultimate capability - Thrust Vectoring. With a new power system and a 2-axis thrust vectoring nozzle, the FlexJet TV is now capable of some of the most advanced aerobatics imaginable. The FlexJet TV is designed by the Flex Innovations team including Top Gun Champion and internationally known jet designer David Ribbe with aerodynamic collaboration from F3A World Champion Quique Somenzini. The construction is EPO foam with multiple carbon spars and joiner tubes in the wings and tail surfaces. Plywood is also used where required. 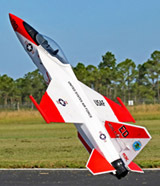 The inlet lips, ducting and vectoring nozzle are expertly engineered to provide efficient thrust over a wide speed range, including 3D (post-stall) aerobatics. The thrust and acceleration are impressive with well over a 1:1 thrust to weight ratio. The plastic tailpipe is lightweight and offers smooth airflow while allowing access to internal components. Fuselage mounted main landing gear is set near the CG for easy ground handling and take-off rotation. The Super PNP includes both long travel trailing-link struts for those who fly on rough surfaces as well as lighter weight wire struts for those who want the lightest weight and best performance possible. Timing of the retracts and doors is automatically sequenced. The generous side area, a mid-set wing, and a large rudder make knife edge flight a breeze. With the addition of thrust vectoring, knife edge loops are now also possible. All-moving " flying stabs" give excellent pitch at all speeds, and even act as ailerons in all pre-programmed flight modes. The Aura 8 advanced flight control system offers a highly refined 3-axis gyro to make the FlexJet TV fly like it is bigger and flying in less wind! Due to its advanced implementation, it will feel like there is nothing in the way of the pilot! The Aura also allows the FlexJet TV to be delivered with advanced expertly tuned features and parameters already in place. An example of this is the secondary control mode which applies separate gyro settings to the thrust vectoring nozzle, while the flight surfaces still retain separate gyro settings needed for optimum performance. These features combine to offer a jet that has unrivaled performance in its class. 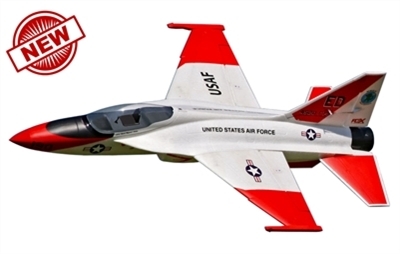 It flies big, and performs more like Quique's 1/6th scale F-16 thrust vectoring turbine jet than a typical foam EDF. Altogether it is an unbeatable performer. Aura 8 connects via USB to your windows Tablet or PC, ensuring you have full adjustment of all settings and the latest firmware updates from the Flex Innovations Team. The FlexJet TV has approximately 90% more power than the original FlexJet while remaining very lightweight. This excess power is intended for up-lines and post-stall (3D) maneuvers ONLY. Because of this, the pilot is required to limit the speed of the aircraft and the G-load on the aircraft. Over-speeding or over-stressing the aircraft can result in structural failure and a crash, which may also cause property damage or injury. DAMAGED PRODUCT(S), INJURY AND/OR PROPERTY DAMAGE CAUSED BY FAILURE TO FOLLOW THE ABOVE GUIDELINES IS NOT COVERED UNDER WARRANTY. Always check the WIKI for the latest Manual Updates and User Advice and Information! For Futaba users, our highest recommended FASST receiver is the R7008SB or R6303SB. For FHSS, the R2008SB.